I colored the image with Copics and used a glitter pen on her wings. The sentiment is also from the same set. The sketch is from Card Positioning Systems. I hope you like it and TFL! The rules are that you have to have a kraft base, at least 1 scalloped shape and only Timeless Twine. I used my Zing with Make the Cut to cut out the LVE using plain old Times New Roman at 1" tall and then the smallest Nesties scalloped heart. I added a button tied with Bubblegum Pink and White Timeless Twine. To finish off the card, I rounded 2 of the corners. This is also for My Time To Craft - fave embellishment (mine is currently twine!). I hope you like it and TFL! I cut the woodgrain patterned paper to size and stamped Little Helper Fhinn in dark chocolate ink. I used the computer to print the To Do at the top (although alphabet stamps would have been just as easy!) and then adhered the paper to the coaster, sanding off any extra bits. Next I covered it with clear adhesive laminate and trimmed to size. This makes it able to dry erase. The last thing I did was adhere 2 strips of magnet to the back so this can be hung on the refrigerator. My tip is that almost any flat surface can be a dry erase board once covered in laminate! Look around and see what else you can find - get creative! This is also for Simon Says Stamp - anything goes. Be sure to check out the YNS blog for all the Fun Friday projects. TFL! I used Manga Girl #2 who, shamefully, has been sitting and waiting for years to be inked! I colored her with Copics entirely in the BV color family (except for her skin), the sentiment is from Papertrey Ink and the baker's twine is from Timeless Twine. Copics used: E00, E01, RV10, BV0000, BV000, BV02, BV11, BV13, BV17, BV20, BV23, BV25, BV29 (the last 4 were used for the shoes and hair). I hope you like it and TFL! 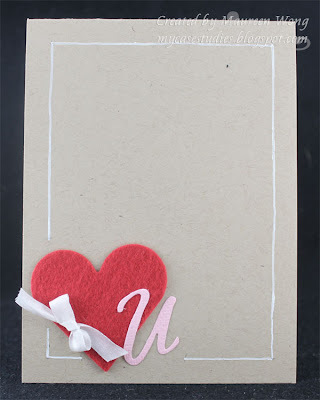 I cut the heart from red felt using a Nestabilities die and the U was die cut with a really old Quickutz die. I tied a little bow and glued it to the heart then drew the white frame all around it. This is also for Truly Scrumptious - something old or forgotten (everything on this card is at least a couple years old!) and Charisma Cardz - Clean & Simple. I hope you like it and TFL! I used the Sweet Pea set from There She Goes and papers from the My Mind's Eye Lost & Found Two (Blush) 6x6 paper pad. I colored the flowers with Copics and did some straight stitching with my machine. Finally, I finished it off with some twill and a button tied with twine. This is also for The Pink Elephant - fave color(s). I hope you like it and TFL! 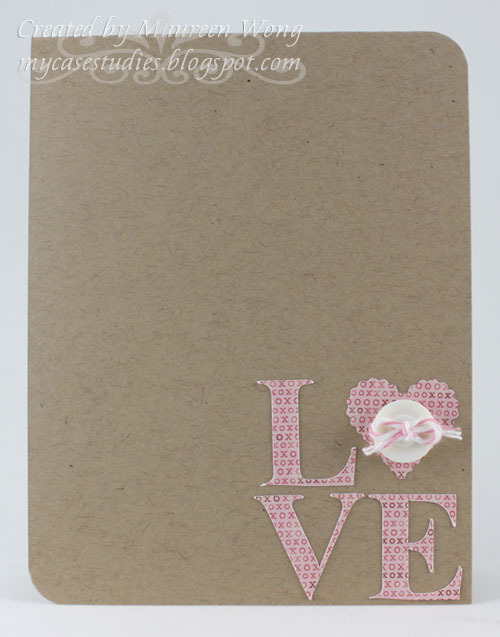 I used the adorable digi image called Josie's Cupcake and formed the card shape in Make The Cut. I printed the image and sentiment (LD Little Piggy), then cut it with my Zing. I colored her with Copics, paper pieced the cupcake liner, and then sewed beads on for the sprinkles. Lastly, I glittered up her wings. I hope you like it and TFL! Hello everybody! 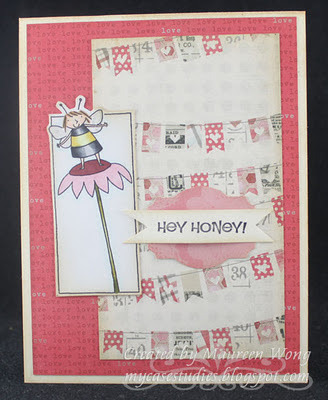 Thanks for joining us for another fun and fabulous Your Next Stamp New Release Blog Hop! YNS just released a brand new line of stamps - Jenny Suchin Designs, so the DT (and our awesome guest designers!) have whipped up some eye candy using the 4 new sets. If you came here by way of Diana's blog, then you're on the right track! If not, please go back and start at Jenny Suchin's blog because you won't want to miss a stop! The Hop starts January 11 @ 3 a.m. EST and ends on January 16 @ midnight EST. And of course there is a prize to be won! One of the stops is the secret blogger and a winner will be randomly chosen from the comments on that stop to win a new set of their choice! So the more blogs you comment on, the more chance you have to win! And finally, there is also a sale!! 15% off your entire order - just use the code YNSJAN2012. I paper pieced the balloons and basket and colored both animals with Copics. The cloud is from the Lettering Delights SVG set Balloon Craze and was cut with my Zing. I then stamped the sentiment from the set on the cloud. I hope you liked my project and thanks for hopping along with us! Your next stop is the incredibly talented guest designer Veronica. I cut the base of the card with my Zing using Make The Cut software. I then stamped the basket image 3 times (once on white cardstock and twice on different patterned papers) and paper pieced the balloons and basket. Next, I cut out the image with a slight white margin, stamped the bunny and colored her with a Copic marker. Finally I stuck her onto the image with foam tape. I hope you like it and I hope I'll see you back here tomorrow for the full release! TFL!